June 20, 2017 -- CommSolid CSN130 NB-IoT IP (Intellectual Property) solution was on tour again – this time in Oulu, Finland. It had been demonstrated at the Keysight booth during the EuCNC 2017, the European Conference on Networks and Communications. The theme for this year’s conference was “5G – European Roadmap, Global Impact” with focus on development of network connectivity technologies in Europe and towards 5G technology validation and deployment. NB-IoT (NarrowBand-IoT) is considered already as a pillar of 5G. 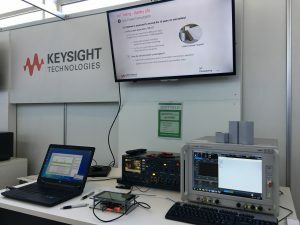 CommSolid NB-IoT solution had been showcased using CommSolid CSN130 reference platform against the Keysight test solution and has gained a lot of attention. Fill out this form for contacting a CommSolid GmbH representative.